The Canberra community has been asked to choose the name of the new public park at West Basin, on the headland next to Commonwealth Avenue Bridge. The City Renewal Authority said the names of a convict-turned-land manager, a landscaper, an architect-artist, and the founder of The Queanbeyan Age were the four options selected by the ACT Place Names Committee. City Renewal Authority chief executive Malcolm Snow urged people to visit the consultation page and find out more about the four nominees. “This new park is going to be a great public asset. This is a wonderful opportunity for the people who will use the park to have a say in choosing its name,” Mr. Snow said. 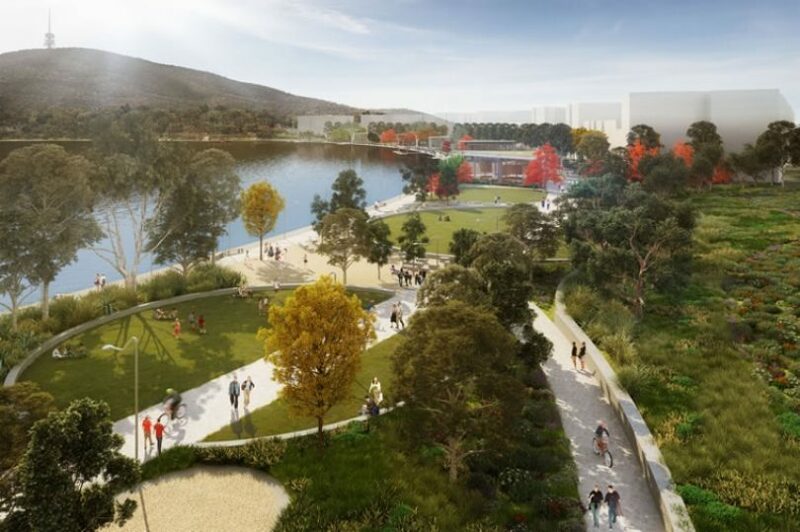 “With 23,000 plants, grassed areas, barbecue facilities, public art, connected walkways and access to the new public boardwalk on the lake’s edge, the park will be a focal recreational destination in the city precinct. John McLoughlin Park – John McLoughlin arrived in Australia in 1811 after being found guilty of stealing two horses in his home country of Ireland. In 1824, McLoughlin was put in charge of 2000 acres, including what is now the site of the National Museum of Australia – the first recorded European grazing run on the Limestone Plains. He also established Canberry station, considered the first settlement by white people on the site of the future national capital. Sylvia Crowe Park – Dame Sylvia Crowe was an English landscape architect commissioned to prepare the landscape masterplan for Commonwealth Park. Dame Sylvia’s design, prepared in collaboration with local landscape architects Margaret Hendry and Richard Clough, offered an opportunity for quiet enjoyment of plants and landscape and emphasised the different qualities of water – still reflections, flowing water, running water and falling water. Henry Rolland Park – Henry Maitland Rolland OBE was a resident architect in Canberra during 1912-16 working mainly on the construction of the Royal Military College, Duntroon. He was the Chief Architect in the Federal Capital Commission from 1925-27 tasked with overseeing the construction of the new city of Canberra and its centrepiece; the provisional Parliament House. John Gale Park – John Gale’s advocacy for the Canberra area as the best site for the future federal capital earned him the colloquial title of ‘Father of Canberra’. He founded the first local newspaper The Golden Age in Queanbeyan in 1860. He served as District Coroner for the Federal Territory and Queanbeyan for many years and was the Member for Murrumbidgee in the NSW Legislative Assembly in 1887-1889. People can vote online at yoursay.act.gov.au until Friday 27 October. The Authority said the nearly 23,000 plants for the new park had been ordered, with about a third grown at the Yarralumla Nursery. The plantings consist of a large range of ground-cover shrubs and grasses – including the locally endangered Button Wrinklewort – as well as 86 new trees. Mr. Snow said the park would be a significant improvement on the previous public space in West Basin. The landscaping will not only significantly improve the attractiveness of the 14,700 square metre park but will also play an important environmental role. “The mixture of native and exotic trees and plants chosen are robust and climate resilient. They will increase the percentage of vegetation cover and improve the diversity of habitat and biodiversity outcomes,” Mr. Snow said. The new park and its adjacent boardwalk are expected to be opened to the public in early 2018.
Who do you think the new park should be named after? Is there anybody else who should have been nominated? Whatever name is chosen I hope that the full name is used. We don’t want another landmark without the person’s first christian name as happened when Lake (Walter) Burley Griffin was named.